Gain insight into human cognition, consumer behaviour and oculomotor processes. Make research with pictures, texts, videos, webpages, software etc. - statically, dynamically and in a gaze contingent way. Create powerful visualizations and perform quantitative analysis. From fundamental scientific research to commercial studies, the NYAN analysis suite is an unprecedented tool for the whole life cycle of an eye tracking study. Its intuitive workflow makes it easy to manage a wide variety of studies in a controlled and flexible way. It guides you through planning your experimental setting, recording the data, and using sophisticated analysis tools for graphical and numerical analysis. Implement your complete study design with NYAN - there is no need for external tools. Different types of stimuli can be integrated into one project. Studies can be customized and ordered in many ways, making almost any design ready to use within minutes. With its synchronized and detailed analysis functions, NYAN allows scientific researchers to study basic visual perception, reading, infant behavior, and psychological and physiological processes. Everything on the screen including images, video and raw data can be exported. Knowing what people see - and, more importantly, what they miss - is the key to an effective marketing campaign that turns people into buyers. Stop guessing and use the unique features of eye tracking to get insight into people‘s attention. NYAN includes powerful visualizations that make it easy to communicate the results. Incorporate eye tracking into your usability testing process to get a uniquely objective insight into user decisions. An unobtrusive eye tracker does not interfere with the participant‘s natural mental processes. 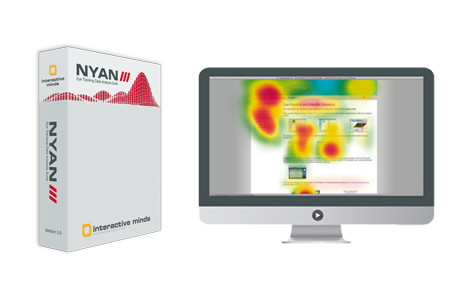 NYAN helps you use eye tracking in an easy way to test websites, software and prototypes. In addition to gaze data, NYAN records user videos, keystrokes, mouse clicks and stimulus events, helping to form an integrated picture of complex human cognition and behavior.